Isn't it amazing that we can tell in only a few months of becoming pregnant whether the little baby will be a boy or a girl! Caren and Gustavo now need a beautiful girl's name that will work in Portuguese, French and English - how exciting! 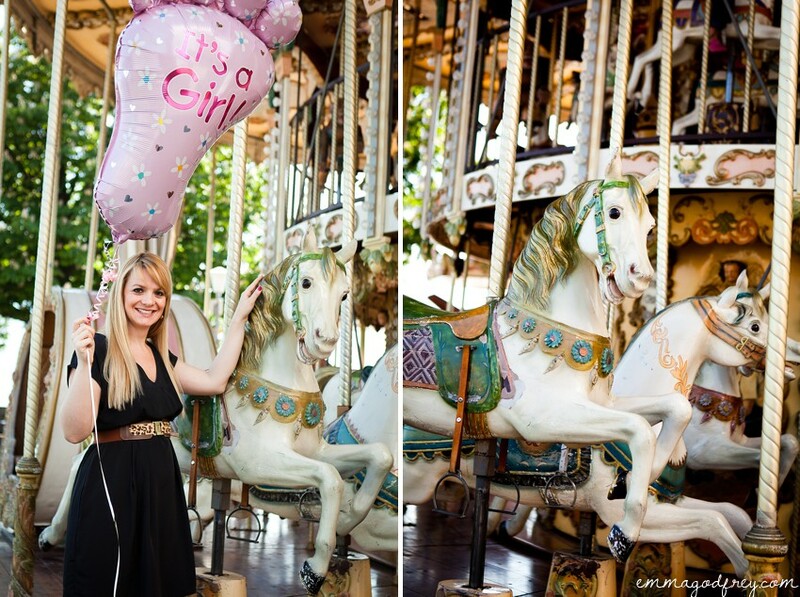 For Caren's 19 week session we decided to explore some of the beautiful spots in old Vevey, starting out with one of her favourites - the carousel. In between rides we managed to get a few shots with the horses without getting moved on by the operator, it was good to pretend to be tourists! Then we found some gorgeous light and Caren showed me some of the little girly outfits she has bought. After some very sassy walking shots, and me managing to lose the balloon!, we found a cute little old-fashioned family shop and one of Switzerland's famous fountains. I just love the colours and doesn't Caren look stunning, this is going to be one gorgeous little girl! If you would like more information on maternity photography sessions, please drop me a line em@emmagodfrey.com.